No restrictions per patient wishes. Generally, visiting hours are 8:00 a.m. – 9:00 p.m.
No restrictions for parents or grandparents. Generally, visiting hours are 8:00 a.m. – 9:00 p.m.
Generally, 8:00 a.m. – 9:00 p.m. Visitors are asked to use their best judgment about time and length of visit. St. Mary’s encourages family members and/or significant others to visit patients in the ICU. Visitors are very important to recovery, bringing a sense of familiarity that cannot be provided by our staff. Visiting is usually limited to two visitors at a time. At times, a staff member may ask guests to wait in the ICU Waiting Room while the patient rests, receives medication or a treatment. To allow our nursing staff to change shifts, visitors are permitted between 8:00 a.m. – 5:30 p.m. and 7:00 p.m. – 10:00 p.m. Patients who are critically ill are very susceptible to all types of illnesses. Therefore, children under 12 years of age are not permitted, as children may have colds or infections that could be transmitted to patients. People who are sick or who live with someone with a recent infectious illness are asked not visit the ICU. The ICU Waiting Room is on the 3rd floor, outside of the ICU. 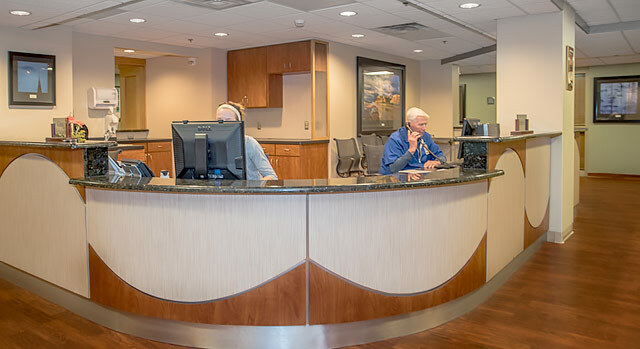 Friends and family members can be reached in the ICU Waiting Room at 580-233-6100 ext. 9344 or ext. 9330. Condition reports on ICU patients are available upon confirmation of a password. This unit is open from 8:00 a.m. – 10:00 p.m. Visitors are asked to use their best judgment regarding time and length of visit. Due to daily therapy sessions, guests are asked to visit on weekend afternoons or weekday evenings between 6:00 p.m. – 8:30 p.m.
No restricted visiting hours. Limit of two visitors in the patient’s room at any time. Visitors of patients in isolation should check at the Nurse Station before entering the patient’s room. Visiting hours are Tuesday and Thursday from 7 to 8 p.m. and weekends and holidays from 3 to 4 p.m. and 7 to 8 p.m. Visits are by appointment only for 15 minute slots. Call 580-233-2273 to schedule an appointment. If you have questions about an upcoming visit, call the main St. Mary's number at 580-233-6100 and ask for the department you'd like to visit.